I think we should stop going crazy over the smart things unless it's secure enough to be called SMART—from a toaster, security cameras, and routers to the computers and cars—everything is hackable. But the worst part comes in when these techs just require some cheap and easily available kinds of stuff to get compromised. Want example? It took just cheap magnets purchased from Amazon online store for a security researcher to unlock a "smart" gun that only its owner can fire. The German manufacturer of the Armatix IP1 "smart" gun which claimed the weapon would 'usher in a new era of gun safety' as the gun would only fire by its owners who are wearing an accompanying smartwatch. However, for the first time, a skilled hacker and security researcher who goes by the pseudonym "Plore" found multiple ways to defeat the security of Armatix GmbH Smart System and its $1,400 smart gun. According to a detailed report by Wired, the smart idea behind the Armatix IP1 is that the gun will only fire if it is close to the smartwatch, and won't beyond a few inches of distance from the watch. 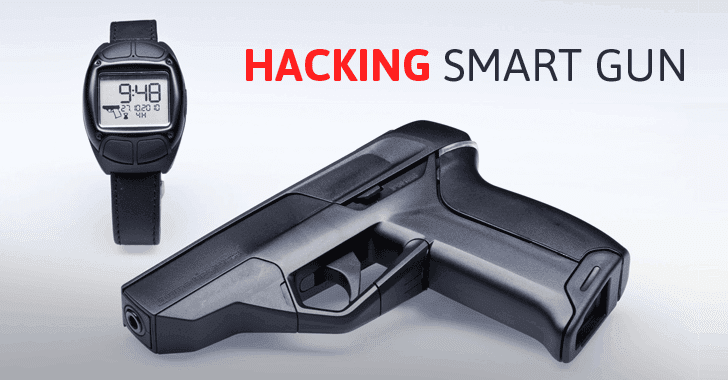 However, Plore found three ways to hack into the Armatix IP1 smart gun, and even demonstrated (the video is given below) that he could make the smart gun fire without the security smartwatch anywhere near it. Plore placed $15 magnets near the barrel of the gun, doing this made him bypass the security watch, thereby defeating the Armatix IP1’s the electromagnetic locking system altogether. "I almost didn't believe it had actually worked. I had to fire it again," the researcher said. "And that's how I found out for $15 (£11.50) of materials you can defeat the security of this $1,500 (£1,150) smart gun." Plore was also able to jam the radio frequency band (916.5Mhz) of the gun from ten feet away using a $20 (£15) transmitter device that emits radio waves, preventing the owner from firing the gun even when the watch is present. The researcher was also able to hack the gun's radio-based safety mechanism by using a custom-built $20 RF amplifier to extend the range of the watch. When the owner squeezes the trigger, the gun sends out a signal to check whether the watch is there or not. But the researcher was able to intercept the signal using a radio device, which acts as a relay that could extend the range by up to 12 feet, meaning somebody else other than the owner could be wearing the watch, defeating its fundamental security feature. Plore believes that if smart guns are going to become a reality soon, they will need to be smarter than this one.